Hagerstown Canteen Service is a full service vending company in Greencastle that also does water filtration and office coffee services. 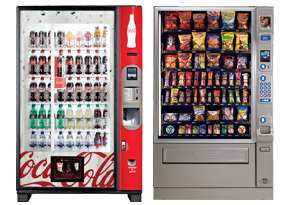 We install the vending machines, keep them filled and clean them, at no cost to your Greencastle company. Coca Cola and Pepsi Cola vending machines are both available. If you have a large staff and need even more selections, we can install a Micro Market at your location in Greencastle. This allows your employees to get a great cup of coffee any time of day or night. It's a great option, especially if you run a third shift and your break room shelves will always be filled with your favorite items. In addition to coffee, we do water filtration in Greencastle as well. Hagerstown Canteen Service installed plumbed in filtration for instant access to hot or cold filtered water. If you're ready to change the corporate atmosphere, call us at (301) 223-8000 or email info@hagerstowncanteen.com and get started right now.